Turn your website into an online store. 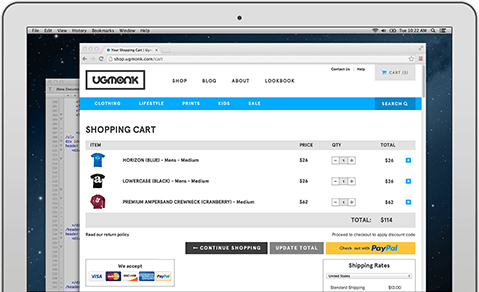 Customers shop on your site and add items to the shopping cart. They are taken to payment pages with purchase details. Customer confirms payment and returns to your website. All of the features you want, without the clutter. You handle the sales. We handle everything from the checkout process, to security, to mobile compatibility. We make life better for our million active buyers around the world. Use PayPal, and turn your website into a global online store. Start selling without the hassle. PayPal handles the complete checkout experience and returns the customers to your site. Customers using smartphones can complete the purchase in three clicks – no integration is required. You pay only when you get paid. Selling is 4.4% + $0.30 USD per transaction or lower, and no monthly fees or hidden fees. Get started quickly with our payment buttons. Just copy and paste a few lines of html code onto your site to create PayPal payment buttons. Works with your eCommerce provider. If you’re working with a shopping cart or e-commerce provider, our Website Payments Standard integrates seamlessly with their solution. Run your store online, and on the go. We automatically optimize the payment experience for mobile shoppers, so they can buy from you with just a few taps. Can I set it up myself or do I need a developer? Our Developer Center provides useful information about our APIs, platform compatibility, set up guides and other technical questions. To keep your customers, keep it simple.